I saw a documentary that said the pyramid originally had a gold cap, like the whole thing was a pyramidal lightning attractor. There's also a subterranean tunnel, which might have served as a grounding channel. If there is ~200 volt/meter potential gradient near the Earth's surface, wouldn't it be possible for the pyramid to capture a current, even when it's not stormy? How they might have used the current for anything useful is another question. I saw the documentary. Seems like a very plausible idea to me. Tesla said that the best conductor was the Earth, even better than copper. The Earth apparently has a net excess of electrons, perhaps it was used as a battery? And pyramids used to concentrate the energy at the tip? And don't forget those underground water tunnels (aquifers), water has very interesting electrical properties. You can generate electricity from dripping water (Lord Kelvin's experiment). The pyramid seems to be a functional device of some kind, because there are no burial chambers, inscriptions, etc. As you say, water in the passages, or other materials, could be used for conduction. But of what use could electricity be to them? Or could the pyramid be a mega lighting rod, intended to protect the region from the thunderbolts of the gods? Yes, good question. Or maybe a sort of lighthouse, lighting the town from the pyramid top? Perhaps some sort of communication device to communicate with other pyramids in other parts of the world (or other planets?). Pyramids centainly was some kind of energy generator and transmiter, and more concrete resonance energy. Inside pyramids and especially Great Pyramid, everything is designed to resonating, even whole pyramid, which lie on rock swivel. There are men states that Great Pyramid was not only generator but deadly weapon, capable to destroy whole regions or even planets (!). Mayby it's linked whith electric catastrophy in our solar system? There is a tunnel in the Great Pyramid that has an astronomical significance; if I'm not mistaken it points to Sirius at some time in the year. The theory I saw is that this was for ritual observation purposes. Going along with our mad ideas about an electrical transmitter of some kind, could it be that the pyramid would capture the electrical energy of thunderstorms (or even thunderbolts of the gods) and beam the energy off towards Sirius, as a signal to presumed gods? The resonance chambers could be about plasma resonance rather than sound resonance. rkm, I don't know if you are familiar with John Burke, but he did some research on the electrical properties of stone in the Great Pyramid. IF he is correct, then I can name some parts. That rectangular cross section "burial chamber", becomes a resonator cavity. The "airshafts" become a transmission line. The "copper door handles" they found at the end of one of the airshafts, becomes a probe. The fact that when they drilled through the door,they found the two handles were connected into a loop, makes this a loop probe. (the probe seems like it's in backwards,but I'm no expert here). The best part, is it explains that odd bending in the "airshafts". That bending was a big question mark for the "ventilation shaft" and the "star viewing shaft" hypotheses. (Not to mention that the shafts don't open to the outside) We need the transmission line to be perpendicular only as it comes out of the resonator cavity,for a length determined by the wavelength. Also, if you are familiar with those crazy ideas of the biblical ark being a capacitor, and legends saying it was once in the pyramid, it actually does make some sense. A resonator cavity (the burial chamber) does actually let us pile up charge at points inside. When I see something like this, from the Pyramid of Menkaure, I have to think "machine". I have also looked at what diagrams there are of some of the ancillary buildings in the complex, and they seem to have no known practical use. One seems like a 3 story high set of pipe organ tubes, but the tubes are of square cross section. I think they knew a lot about wave mixing, acoustics, resonance. 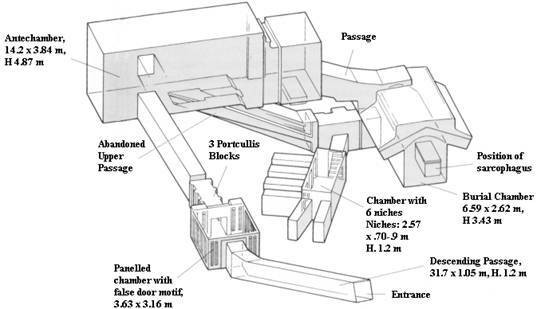 Taking the dimensions of the Kings chamber sarcophagus, it would have had a resonance of around 430 Hz, and likely it was 432Hz, an important number to some of us. The sarcophagus, of pink granite, had turned to brown, which requires quite a while at high temperature for that to happen. I think pyramids were multipurpose. I'm very confident they were ram pumps. The ram pump generated pulses that made the king's chamber resonate, which has layers of granite hard to explain to be there if not by some piezoelectric properties. So they may have some electric use. The most amazing thing is they were able to carbon date pyramid tunnels being filled (by a later civilization?) approximately 12000 years ago. This coincides around with the age of the underwater city off the Indian coast. Other carbon dating suggests the Bosnian pyramid is at least 20+ thousand years old. The 12000 year date also coincides with the Quebec meteor event. which I believe is much bigger than currently thought (ie I believe the Hudson Bay was some sort of electric/meteoric event), but not sure how these dates and events would line up with conclusions drawn from comparative mythology. The Bosnian pyramid still needs a lot of excavating and discovery. The problem with carbon dating is that we can never be sure of the accuracy as it is based on the assumption that the amount of carbon in the environment has been more or less the same in the past as it is today, and that the half-life would not vary (which we now know that element's half-lives can vary). I would recommend looking into the fine detail, rather than thinking of current electrical thinking. Above all, think re-incarnation...and the required potentials to achieve such locally. Interesting video jc, particularly the ceramic slab with the undulating surface. It sure would be interesting to know what was in the centre. It's looking to me as if microwaves were again involved, as to heat a slab of that mass by external application of heat would be all but impossible, while with microwaves it can be heated evenly throughout in a very short time. The shape of the surface of the slab reminds me of some of the rocks I have found on the beaches around here, mainly only accessible at very low tides, that are amazingly smooth to the touch, and have that partially melted appearance. I guess I need to get a sample and see if the beach rocks are also ceramic. Whoever built that place surely had knowledge that was just not supposed to have existed at that time. Considering the Electrically interesting 'Band of Peace' video, the late Chris Dunn's work on Pyramid harmonics and construction and the Brian Cox's narrated 'Revelation of the Pyramids' video I was wondering if anyone was still talking about this topic. It seems to be a wonderful and partially testable hypothesis. Especially with the introduction of enhanced electrical charge and perhaps a capacitance and perhaps a radiance. If there is another video on the topic I would love to hear about it.